Friday, May 1, 10am – 4pm. Bailey House Museum, Wailuku. Lei Day Heritage Festival – Another May Day event. Sponsored by the Office of Hawaiian Affairs, the event will feature Cultural Activities, Lei Making Competition, Food, Special Exhibition, and more! FREE! Friday, May 1, 8:15am – noon. Grand Wailea Resort, South Maui. May Day is Lei Day. Vote for your favorite lei, watch a free dance performance and drink a May Day cocktail. Friday, May 1, 12:30pm. Lei Day at Haleakala Waldorf School. Kula.Watch students perform May Day dances. FREE! Friday, May 1, 6pm – 9pm.May Day in Wailuku – First Friday. Celebrate Friday night in Wailuku with live music and leis. Food vendors, live music. FREE! Friday, May 1, 7:30 pm, May Day concert featuring beloved performers Robert Cazimero and Raiatea Helm at Maui Arts & Cultural Center, Wailuku. Pre-show festivities start at 5:30pm (including hula, leis and island style food). Friday, May 1 – Sunday, May 3. OluKai Ho’olaulea. Annual North Shore water event that combines competitive racing, luau, noncompetitive “paddle event” with family friendly activities like free surfing canoes and SUP (Stand Up Paddling demos). Ho’okipa Beach Park. Friday, May 1 – Sunday, May 3. St. Joseph’s Feast. Makawao. Annual family friendly event with activities for kids, food booths, music, games, crafts. My friend says the malasadas (Portuguese deep-fried doughnuts are the bomb.) FREE! Saturday, May 2 – Sunday, May 3. MAPA’s Spring Extravaganza. Maui Arts and Cultural Center. Maui Academy of Performing Arts students showcase 3 different dance performances. Times and admissions vary. Saturday, May 2, 8 am. 3rd Annual Golf Classic in Lahaina. Royal Ka’anapali Golf Course. Saturday, May 2 – Friday, May 8. Times and locations vary. Maui Classical Music Festival. Saturday, May 2. 5 – 9pm. Maui Teen Expo. Queen Ka’ahumanu Center, Kahului. Free entertainment, giveaways and demos. Saturday, May 2. 9am – 9pm. Grand Opening/Free Comic Book Day. Maui Comics, 333 Dairy Road, Kahului. Sunday, May 3. 9am – 2pm. Spring Craft Fair. First level of the Macy’s parking structure. Queen Ka’ahumanu Center, Kahului. 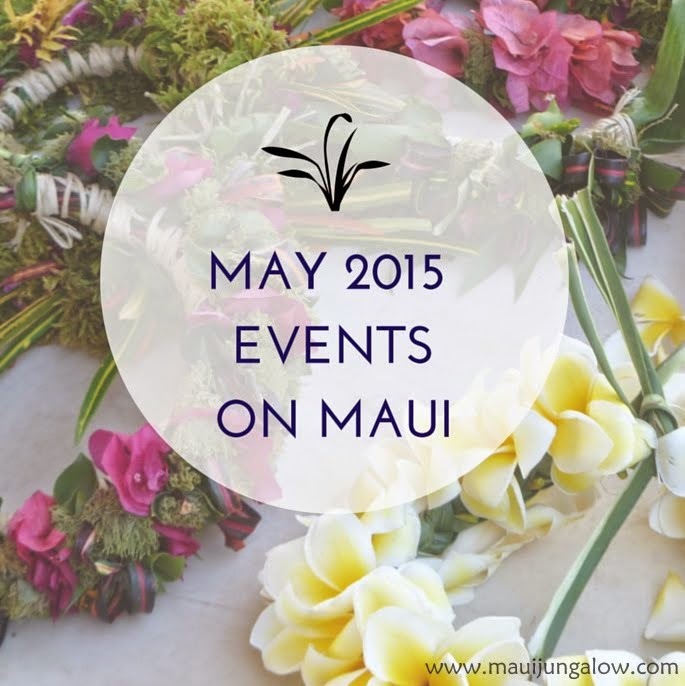 Sunday, May 3, 5-8pm – A Night with the Flowers – Benefit for Maui Nui Botanical Garden. Kahului. Sunday, May 3. 10 am - 6 pm. Grand Opening of Driftwood, a new boutique in Makawao. Monday, May 4 – Friday, May 8, times and locations vary – 2nd Annual Maui SmallBusiness Week. FREE workshops for small business entrepreneurs across the island. Must register in advance by scrolling to the BOTTOM of the website and looking for “Coming Events (RSVP page)” unless they have changed the RSVP location on the website. Tuesday, May 5. All day. It’s Cinco de Mayo! Hard Rock Café in Lahaina is having live music, burrito eating contests and a best moustache contest. Tuesday, May 5. 5 pm – 10 pm. Cinco de Mayo at Flatbread in Paia. It’s the Tuesday Benefit Night, this time for the Haku Baldwin Center, which provides therapy with horses for special needs children. Tuesday, May 5. 5 pm - ? Cinco de Mayo at Sangrita Grill. Free cookies to the first 55 diners, special menu, flamenco dancing (from 7:30 to 9:30pm), and free lime pie to 100 lucky diners. Friday, May 8, 6:30pm – 9pm Kick off event for Maui Matsuri. Queen Ka’ahumanu Shopping center, Kahului. The 2015 Maui Matsuri kickoff event will feature taiko drumming performances, karate demonstrations, coloring contest, appearance by Hello Kitty, and more. The event will conclude with obon odori an (bon dance) practice around the stage at approximately 8:15 p.m. FREE! Friday, May 8 – Saturday, May 9. 23rd Annual Celebration of the Arts. Ritz Carlton, Ka’anapali. Hawaiian artists, cultural practitioners, artisans, dancers, educators, entertainers, and speakers share Hawaii through their eyes. Some events are free, others have a charge. Some of the more interesting events include Hawaiian chanting and ceremony, in which photography or video is NOT permitted. Saturday, May 9, 9am – 4pm. Seabury Hall 42nd Annual Craft Fair. 480 Olinda Road, Makawao. The premier craft fair on Maui, which is held the Saturday before Mother’s Day. $5 admission, children under 12 are free. 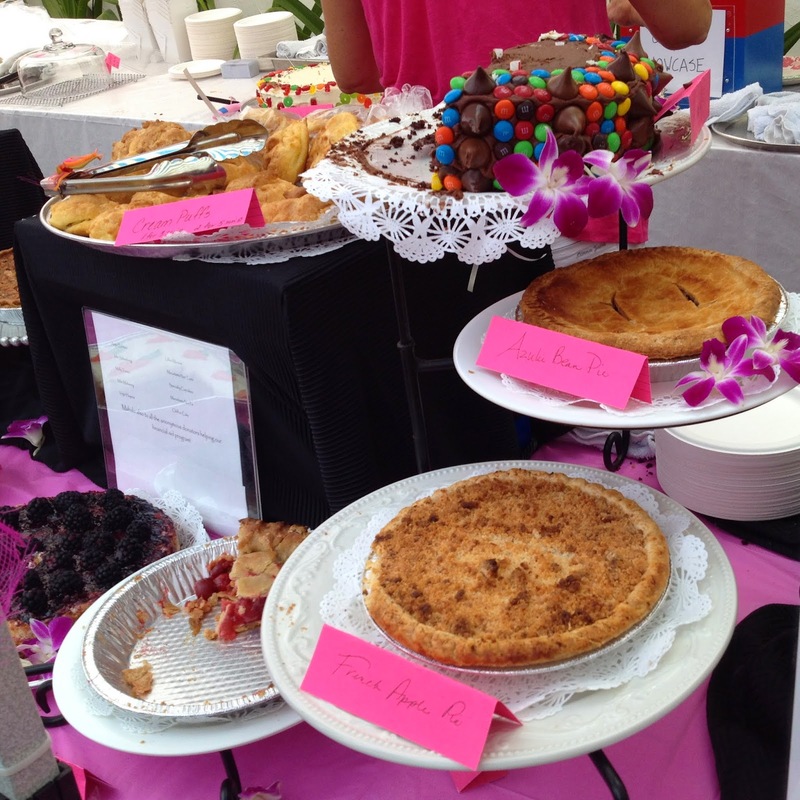 Infamous dessert table (one of MANY dessert tables) at Seabury Hall's Craft Fair. Saturday, May 9. 7 am - 9am. Maui Visitor Industry Charity Walk. Kahului. Raise money for your favorite local nonprofit. There is live music, entertainment and food along the 3.1 mile walk. Must register in advance! Saturday, May 9. 10 am – 5 pm. Paddle Imua, a benefit race for Camp Imua starting from Maliko Gulch and ending at the Hawaiian Canoe Club in Kahului. Non-racers can watch the event and participate in the free ‘Ohana Festival starting at 1 pm. Saturday, May 9. 10 am – 2 pm. Portuguese Festa. Portuguese Heritage Garden, Kepaniwai Park, Ia’o Valley, Wailuku. The Maui Portuguese Cultural Club hosts a fun day, including a Coronation of Mary Ceremony, traditional Portuguese dances, a country Store with homemade jams, jellies and pickles, traditional stone oven bread, baked goods and a special Portuguese lunch. FREE, except lunch is $8 in advance or $10 at the door. Wednesday, May 13. 5pm – 10 pm. Mai Tai Tech Night. Maui Tropical Plantation. Opportunities to pitch, network and rub elbows with leading venture capital investors and tech company executives. A must go-to event for rising entrepreneurs. Friday, May 15 – Sunday, May 17. Maui Start Up Weekend. Maui Economic Development Board, Kihei. Pitch your start up idea, create a business plan, and form a company in one adrenaline-filled weekend. Saturday, May 16, 4 pm – 7 pm. Maui Brewers Festival, Maui Arts and Cultural Center, Wailuku. Plenty of food and beer. Saturday, May 16, 1 pm – 6pm. Da Taste of Keokea culinary festival, hosted by the Keokea Homestead Farm Lots Association. Drive Upcountry to look at the blooming jacarandas and enjoy local favorites, including: pastele sausage; pa‘i ‘ai chicharron; kalua pork with watercress; poke; chow fun. If that’s not exotic enough, there are also cheeseburgers, French fries, roast turkey and banana bread! Plenty of local entertainment including hula, Hawaiian music.$1 admission. Keokea Marketplace, Kula. Saturday, May 16, 2 pm – 9 pm. 15th Annual Maui Matsuri Festival, University of Hawaii – Maui College. Japanese & Okinawan cultural entertainment, food & craft booths, demonstrations & exhibits, cultural crafts and games for kids, manga & art contest, hanafuda contest, eating contests, Cosplay (costume) contest, video-gaming, obon dancing, and more. Thursday, May 21, 6 pm (Third Thursday). Mauna Kahalawai (West Maui) Chapter of the Hawaii Farmers Union United has a locavore potluck and great speakers. FREE if you bring a potluck dish. Location is usually the Maui Tropical Plantation, Wailuku. No website yet, info generally posted on the HFUU Haleakala FB page. Friday, May 22 – Friday, May 29. Spring Sufi Camp. A weeklong retreat featuring yoga, meditation, ecstatic dance. Options include going for just a day, the weekend, or the full week. Ke’anae YMCA Camp. Friday, May 22, 9 am – 1 pm. Blossoms for the Brave. Maui volunteers will make leis to honor graves of veterans at the Makawao Veterans Cemetary for Memorial Day. Wailuku, front lawn of the County Building. Friday, May 22, 6:30 pm. Musical Benefit for Andrea Walls, violinist for Soul Kitchen Maui, who damaged her hands. Mulligans on the Blue, Wailea. $10 at the door. Saturday, May 23. 9 am - 12 noon. Ko (Sugarcane Workshop) at Maui Nui Botanical Gardens, Kahului. Learn the different varieties of Hawaiian sugarcane, sample fresh sugarcane juice, and ask questions. Reservations required! Saturday, May 23. 7 am – 1 pm. Outgrow Monsanto CommunityPlanting and Locavore Potluck at Simpli Fresh Farm in Lahaina. Instead of marching, visit a farm and plant real food. 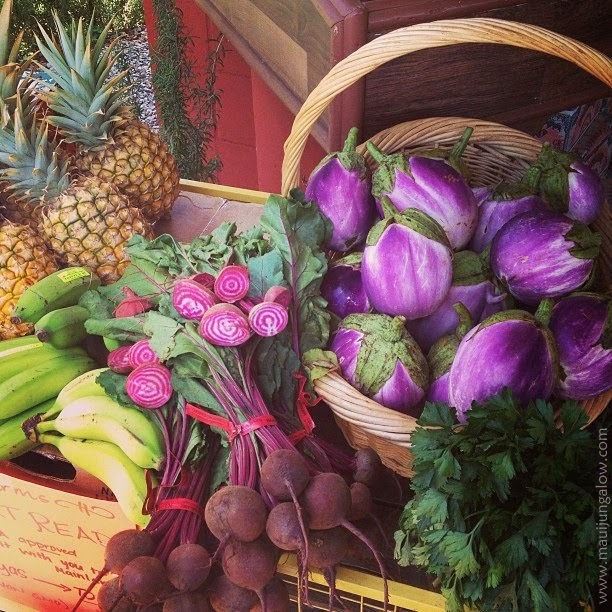 This is also Edible Hawaiian Islands Farm Day, so use #EHIFarmDay15 when tagging pics on social media. Saturday, May 23. 7 pm. Just Desserts Fundraising Soiree for Adaptations Dance Theater at the Hui No’eau. Enjoy delicious desserts, dancing, and entertainment. Saturday, May 23, 7 - 11 pm. ArT=Mixx: Aquasonic. Another fantastic multimedia ArT=Mixx event at the Maui Arts and Cultural Center. For 21 and over. Dance, music, video, art-making and networking. FREE! Sunday, May 24 – May 30. Wailea Restaurant Week. Participating restaurants in Wailea offers special pricing and 3-course menus, benefiting the Maui Food Bank. Tuesday, May 26. 6 pm – 9 pm. 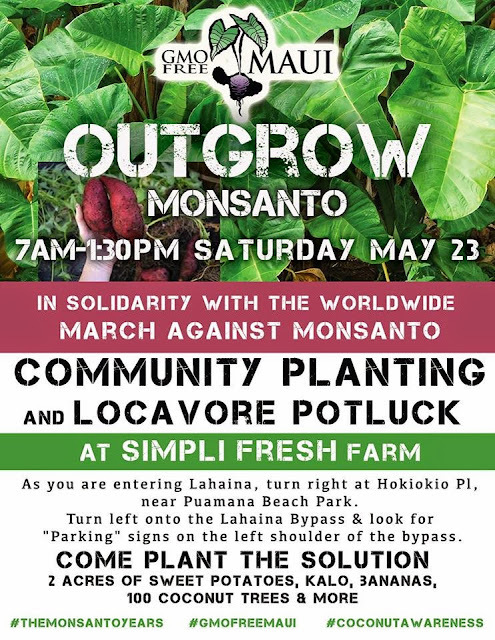 Haleakala Chapter of the Hawaii Farmers Union United has a locavore potluck and public meeting, sharing community info, tips on farming, and great speakers. FREE if you bring a potluck dish. Haiku Community Center. Saturday, May 30, 7 pm – 9 pm. Huliau Environmental Festival. Iao Theater, Wailuku. Short environmental films made by students 12-18 will be shown to celebrate their work and raise funds for the program. $15/adults, $5 for 18 and under. Also, Maui Friday parties happen the first through fourth Fridays in different towns on the island. Ahimsa Farm Sanctuary usually hosts vegetarian farm to table dinner and music events on Saturdays. Events will be updated whenever possible. These event listings are not geared for tourists so they do not include free hula shows which happen in several places around Maui. For other blog posts, visit the Archives.